November; this morning everything was completely steeped in fog and remained that way 'til about lunchtime, most leaves have curled and fallen but some were fresh in their copper coats. Dull November afternoons are the best occasions for crafting indoors. You will have to forgive my rather mundane selection of leaves for the purpose of this post; most were lying placid in the lanes and I merely selected a few of which were not too dirtied or spoiled. I love when a leaf has different colours merging together within its skin; I love to preserve it right in the middle of its transformation, to keep it from rotting and decaying any further. Skeleton leaves are a favourite to press too. 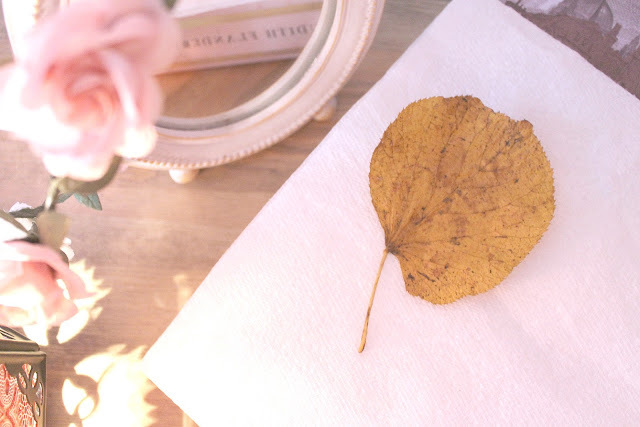 There are so many different ways to press leaves: I have come across so many over time but this is my personal favourite method, especially for scrapbooking. 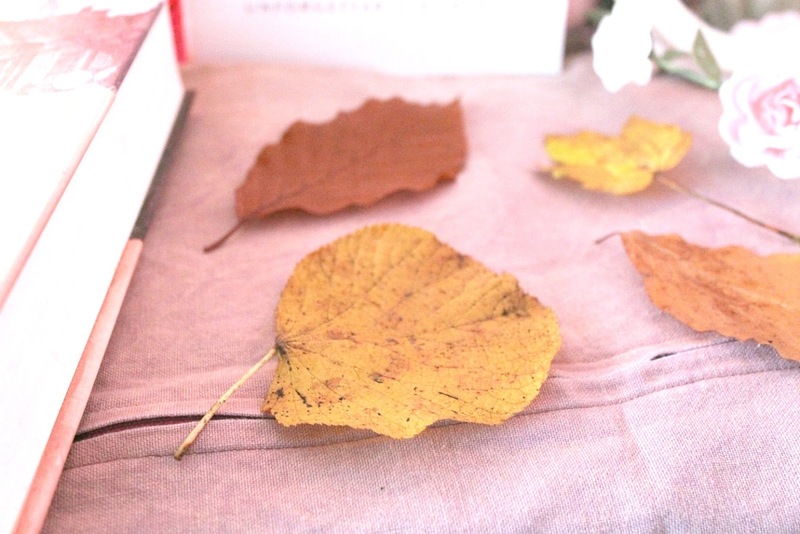 A selection of different shaped and colourful leaves: the brighter and the more colours, the better as leaves often loose their colouring a little through the drying process. Choose ones that have no rotting or spoiled patches: these will become more apparent once the leaf has dried. If they are dirtied I just clean them gently under the tap. Here I am using a beech, an aspen and two baby sycamore leaves that are smaller. A heated iron: *make sure to be careful here and ask someone else for help if you are unsure* A light towel or similar: I have used a light cushion cover. If the material is thicker you might have to iron for slightly longer. Absorbent paper/kitchen roll: I found that kitchen roll works really well due to its absorbent qualities. A heavy book: I love to use encyclopaedias and large dictionaries but any will work fine! 1. Lay the leaves flat between the absorbent papers, fitting as many on to one page as you can, but not to overlap. *The lady on my Givency advert loved playing in the leaves! * Then once you have placed the other paper on top of them, place a light towel or similar on top of that. 2. With a heated iron, gently press down on the light towel, moving it around so it leaves no scorches. Repeat this for 3-5 minutes, then turn the leaves inside over. Repeat again. 3. The leaves inside should now feel dried and have a papery texture to them. They should feel completely dry to the touch. If not, repeat step two until results are achieved. 4. Placing each leaf between two pieces of absorbent paper for safety, press them in one of the middle pages of a heavy book, about 20 pages apart. I like to keep them there for a few days to a week, but it may also be preferable to simply seal them with craft spray, to preserve the remaining colour and keep them in good condition. Have you ever pressed leaves before? 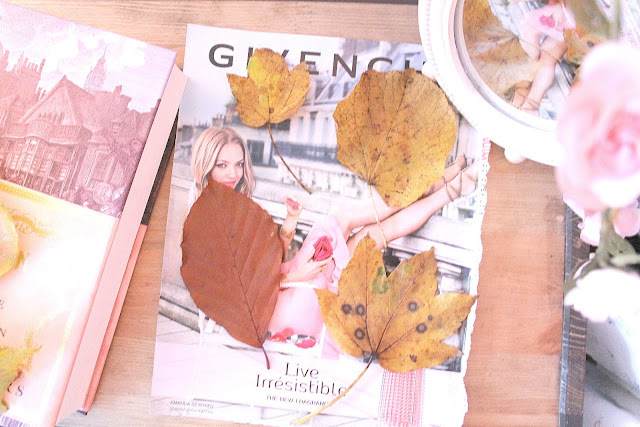 If you find a beautiful leaf or flower, or fancy adding a touch of nature to your scrapbook, it's so lovely to do! I probably say this every time I comment, but I literally can't get over it (sorry I'm not sorry ;))---your photos are BEAUTIFUL~ What camera do you use if you don't mind me asking? I don't think I've ever pressed leaves before but I do remember pressing flowers. It's such a neat way to add some beauty to a project! I remember doing this as a child and loving it, but completely forgot how to do it! How lovely, I will try this with leaves, I used to do it with flowers. :-) Thanks for sharing it dear! Hope you're having a great midweek so far! Aw so pretty! I used to do this with flowers when I was younger but haven't done it in years! This definitely is a beautiful time of year. I love autumn but I hate winter! :) I have always thought of pressing leaves but really never knew how to do it properly. I think this is a lovely idea and thanks so much for sharing the process! This is such a great post, I definitely need to try this! Wow I've never thought of pressing leaves like this! Thank you for sharing this, I love crafts during autumn! I used to love pressing flowers when I was little I definitely need to do it again! I have never pressed leaves it looks likes a wonderful way to add nature to your decor. In a tropical country like ours, theres only 2 seasons summer and rainy season. Its still hot like summer here in our city. I was hoping to atleast enjoy rainy and cold season during this time of the year but yeah hopefully in the coming days. I have never tried pressing leaves before. This is interesting to try. Thanks for sharing Elizabeth. This is so delicate and pretty :) Thanks for sharing! i've never pressed leaves, but have done so with flowers. they are very pretty! I love pressing flowers they make such interesting pictures. What a cute idea! I remember pressing leaves when I was in grade school but of course they were nowhere near as pretty being that I was 7 years old! I think I did this once for an English project when I was younger and I loved it! Gonna try to do this again! Wish we have autumn here. Will try this for you! Ohhh amazing I definitely need to do this!! Happy November to you Elizabeth! Nice photo you have, and pretty leaves collection. I never pressed leaves before, but I'd like to do that... it will be a beautiful collection. Thanks so much for sharing your process, such beautiful photographs too!